Dr. Zakariya Diouf is the Founder and Director of Diamano Coura West African Dance Company. He received his Ph.D. in Ethnomusicology from U.C. Berkeley and was director of the Mali Ensemble, a multinational company representing the unity of the West African countries of Mali, Senegal, and Guinea. He became director of “Les Ballet Africaines” in 1963 and later Le Ballet National du Sénégal from 1964-1968. In 1969, he joined the faculty of Southern Illinois University, working with Ms. Katherine Dunham. Dr. Diouf has taught at San Jose University, Sonoma State University, the University of San Diego, the University of California of Los Angeles and San Francisco, and California State University-East Bay. Dr. Diouf currently teaches West African music, dance, and history at Laney Community College in Oakland. He has done extensive research into African music and dance along with choreographing some of the best dance and dramatic pieces for renowned companies including the San Francisco Ballet. In 2005, along with the Honorable Ron V. Dellums, Dr. Diouf was honored with the Community Leadership Award by the San Francisco Foundation for his vision in unifying the African cultural arts community, for serving as a mentor and educator of young artists, and for his artistic contributions to the development of African-based performing arts. On June 22, 2013 he received the Malonga Casquelourd Lifetime Achievement Award from the San Francisco Ethnic Dance Festival. 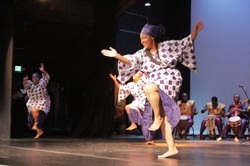 Naomi Gedo Diouf is the Artistic Director of Diamano Coura West African Dance Company. She has assisted and choreographed works for numerous performing companies including the Dutch Theater Van Osten in the Netherlands and Belgium, and U.C. Berkeley’s Drama Department. In 1998 and 1999, Mrs. Diouf collaborated with the San Francisco Ballet in the premiere of “Lambarena,” an African and classical ballet fusion piece for the Ballet for Utah, Pacific Northwest Ballet, Ballet of Florida, the Singapore and South African Ballet. A strong advocate of Arts-in-Education, Mrs. Diouf has worked with the Arts in Education programs in the San Diego, Los Angeles, San Francisco, Oakland, Richmond, and Alameda School Districts to promote cultural literacy. She was named one of America’s top teachers in the Who’s Who Among American Teachers and has received numerous awards and recognition. She currently teaches West African dance and culture at Berkeley High School to over 400 students per semester. She also teaches at Laney College and the Malonga Casquelourd Center for the Arts in Oakland. In addition to being an educator, she also consults and conducts workshops in costume design, cultural events/program coordination, and West African culture. Esailama Diouf-Henry began her professional career as a performing artist with Diamano Coura West African Dance Company in 1989. 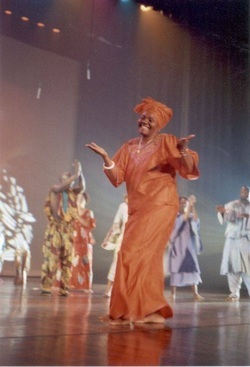 In the last 15 years Esailama has also worked independently with choreographers and directors in the United States from various genres of African-derived dance theatre including the late Dr. Pearl Primus and Kemoko Sano and theatre companies such as the Ballet Folklorico de Bahia, Les Ballets Africaines, and the Liberian National Cultural Troupe. Internationally, she has worked with director John Martin (London) and such performing companies as Le Ballet National du Sénégal (Senegal), Theatre for Africa (South Africa) and Abhinaya Theatre Research Centre (India). As a teacher she has lectured and conducted long –term workshops throughout the United States, in India, Barbados and Trinidad-Tobago. For 9 nine years she worked closely with actor Danny Glover as a scheduler and consultant and has earned her doctorate in Performance Studies from Northwestern University. She is cofounder of Nfungotah Inc., dedicated to supporting African Diaspora arts and performing artists and co-owner of Bissap Breeze LLC. Madiou Diouf hails from the United States, Senegal and Liberia, West Africa. Growing up with a strong percussion background he was first taught by his father Dr. Zakarya Diouf at a young age to play both djembe and sabar drum orchestra. In 1998 Madiou landed his first big gig, playing with renowned musicians in the '98 Olympics followed by the 2005 BET Awards opening act. Currently a Sound Arts major at Expressions College for Digital Arts he is also a producer and founder of Spoken Hands Productions. Ibrahima O. Diouf began dancing professionally at the age of 12 with Diamano Coura West African Dance Company led by Naomi Diouf and Emmy Award winner Dr. Zakariya Diouf. Alongside his national and international work with Diamano Coura he has studied with other artists and companies including: Kankouran Dance Company led by Assane Konte in Washington, DC, Youssouf Kombassa in New York, the late Abdoulaye Camara former Director of the National Dance Company of Senegal and Alabatu Dance Company in New Orleans, Nimley Napla former Director of the Liberian National Culture Troupe and the late Kemoko Sano former Director ofLes Ballets Africaines (Guinea). Spreading his dance wings into Hip-Hop and Drill Team Ibrahima has studied with NewStyle Motherlode led by Corey Action and Teela Shine and Mixed Blues. Ibrahima is currently will be attending the Arts International University for Art and Design. Nimely V. Napla is a master dancer, craftsmen, costume designer, choreographer and former director of the Liberian National Cultural Troupe. Nimely came to the United States in the early 1980s while touring with the Cultural Troupe to perform at the Louisiana World Exposition and share his artistic talents and vision. He was awarded a certificate from the Commissioner General for his service to the New Orleans SPCA classic horse show. In August of the same year he also began work with the New Orleans Public School System’s Artist-in-School program. From 1985 to 1989, Nimely founded a performing company in Columbus, Ohio and in 1994 he moved to Minneapolis, Minnesota where he currently reside and formed the Nimely Pan African Dance Company, the only Liberian traditional dance company in Minnesota. 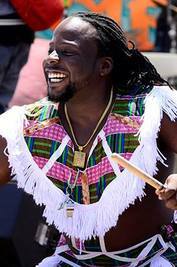 Under his direction the Nimely Pan African Dance Company has toured nationally and annually hosts Panafest, a West African dance and drum conference. The company has been invited to perform by the NAACP in Washington DC and for numerous Liberian delegates including Ambassador Rachel G. Diggs and for two years in a row, Liberian President Ellen Johnson. Nimely has been awarded a Certificate of Excellence by former Minneapolis Mayor Sharon Sayles Belton, and has performed and created woodcarvings at the Black Arts Festival in Atlanta, the 1996 Olympics, and as an educator with numerous school districts in Minnesota, California, and Louisiana. As costumed designer and choreographer he has been commissioned by renowned companies such as Diamano Coura West African Dance Company based in California and Kankouran Dance Company based in Washington, DC. LaTashia Bell hails from Oakland, California. She has performed and toured with Diamano Coura since 1993 throughout the United States and internationally. She believes that, "dance is my life's passion, my soul's joy." Patrice Henderson has been dancing since the age of eight it was in middle school that Patrice Henderson discovered her passion for dance. She enjoyed various styles of dance, yet it was West African dance caught her eye and heart. she first began her dance career with African Queens, dancing throughout California and touring in Beijing, China. In 2006 she joined Diamano Coura and currently is majoring in dance hoping to one day direct a company of her own. Darian La Foucade hails from Trinidad and Tobago, West Indies. In 1993 he moved to the San Francisco Bay Area and began studying various styles of dance and drumming with Dehcontee Liberian Dance Company. Two years later he joined Diamano Coura West African Dance Company developing his skills in choreography while working as an apprentice teacher under Diamano Coura company directors, Zak and Naomi Diouf, at Berkeley High School. Darian has performed professionally in major theatre venues and universities in San Francisco, New York, Minneapolis, Washington DC, Houston, Las Vegas and Taipei, Taiwan. In 1997 Darian was awarded the Barkley Philanthropic Society Fellowship Award, continuing his mission to impart to all age groups the knowledge and skills of West African dance and drum history and culture that he has acquired over the years and continues to learn. Dedeh A. La Foucade began her professional career in dance over 20 years ago. Through her study and performance of West African dance she has been able to stay grounded to her Liberian roots and pass her embodied knowledge down to her children and generations to come. She began her professional career in 1993 with Dehcontee Liberian Dance Company, based in Oakland, California and by 2000 had advanced to Assistant Artistic Director. In 2005 she decided to expand her repertoire of dance and joined Diamano Coura West African Dance Company. With Diamano Coura she became versed in dances from the regions of Mali, Guinea, Gambia and Senegal while also furthering her understanding of Liberian dance culture. For Dedeh, dance is "the rhythm within that moves me through every aspect of my life. Being a part of Diamano Coura is a wonderful experience that I wouldn't trade for anything in the world. There is such an extreme amount of knowledge that not only helps me with dance but to also guide me through all aspects of life. I plan to continue dancing until my body and spirit won't allow me to. Dancing brings me balance, it completes me." Tamika Davis's passion for West African dance began her sophomore year at Berkeley High School then continued on to classes she took at Laney and Alameda Community Colleges. From her dance experiences in high school and through college she realized that all she wanted to do was to live, feel and breath West African dance. She joined Diamano Coura in 2000, premiering in performances at the San Francisco Ethnic Dance Festival, Mendicino Ethic Festival and other major engagements statewide. Her experience with Diamano Coura has continued to amaze her and she looks forward to the next 10 years of being one of "those who bring the message." Tavita Bass -Being exposed to the West African dance changed my life! It saved me and introduced me to a talent that I never knew existed. It came to me at such a fundamental time in my life. I have been a dancer since I entered High School in 1993. It set a tone for how I would spend my high school years and made a place in my adult life. Mama (Naomi) and Papa(Zak) delivered this blessing. I am forever connected and motivated by the drums. Through the drums I connect to the universe in a way I will never be able to describe. This of which allows me to connect my mind, body and soul. It liberates my spirit. I am thankful that Diamano Coura gives me the opportunity to perform. Whether I am on a stage or not dance will always be apart of me. Jessica Harden is originally from Berkeley, CA and has been dancing professionally since the age of 8 years old. She previously belonged to Our Thing Performing Arts Company located in Berkeley, CA dancing a fusion of styles inspired by Modern, African, and Interpretive dance. In 2000, she was introduced to the founders of Diamano Coura West African Dance Company as an eager student at Berkeley High School in Berkeley, CA. By 2004, she became a member of Diamano Coura, and has performed on a national and international level with the company ever since. Nationally, she has worked with organizations such as World Arts West involved in the events "The Ethnic Dance Festival" and "People Like Me." Internationally, she has had the opportunity to perform in Turin, Italy, Veracruz, Mexico, and in the summer of 2012 she spent a month in Senegal, West Africa. Diamano Coura, which means "those who bring the message" is exactly what Jessica has committed her life to doing, spreading the richness of traditional African culture, song, and dance is one of the most fulfilling aspects of her existence.